Medium - $39.99 Large - $39.99 X-Large - $39.99 Only 4 left! Do you know why we have a particular hand gesture for when we really, really want to tell someone that we don’t like them? Well, back in the day, army archers were trained to pull back their bowstrings with the tips of their middle fingers. Naturally, when they were captured, the opposing army wanted to make sure their new prisoners would never pose a threat to them in battle again. So they “removed” their middle fingers, permanently disarming them if you will. So, an archer who had never been captured would defiantly throw up their middle finger before a fight as his way of saying, “Hey! I have a middle finger and I’m going to shoot arrows at you!” We honor that tradition to this day when people cut us off in traffic. Archery still reigns supreme as a way of dealing with bad guys. Look at the Avengers: a serum-fueled super soldier, a gamma ray infused walking battering ram, a deadly miracle of electrical engineering, a Norse god of all things, and...a guy who’s a really good at archery. Look at the Justice League: a Kryptonian who can destroy a solar system with a sneeze, the king of the ocean, a man who can run at mach 3,000, *Batman*, and...a guy who’s really good at archery. Bows and arrows are here to stay, folks, because at the end of the day they’re just super cool. If you want to tap into that endless font of coolness, then we’ve got just the costume for you. 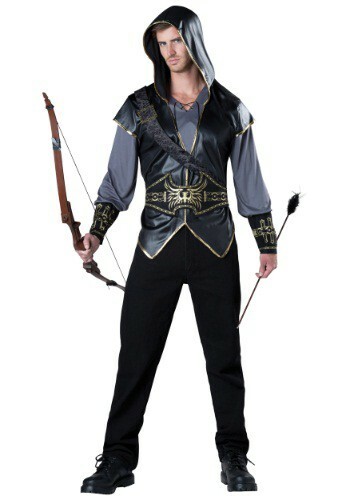 Our Hooded Huntsman Costume is hooded to keep the sun out of your eyes while you’re lining up that perfect shot. Like the rest of the costume, the belt has antique metal accents to keep you looking authentic and studly. This is clothes for hunks. Check please.